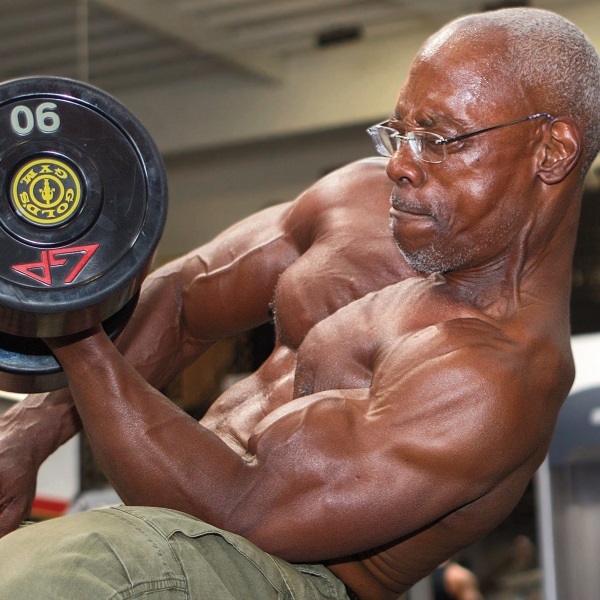 IS THIS THE MOST SHREDDED NEAR 60 YEAR OLD EVER? Most people with ambitions to become swole bodybuilders are usually younger men with the drive and determination to look like their favorite superhero. When it comes to athletic endeavors it’s a young man’s game. Age is the great equalizer and it’s an eventuality that all people must accept. Age is something that takes it’s toll on every being on the planet. No matter how badly you try, you can’t escape time. Or least that was the saying. With bodybuilding it seems you never quite know what you’re going to get. As far Ronald King is concerned, age is simply nothing more than a number. Every bodybuilder who looks to stick with it and build their bodies for long enough usually do so because they understand that muscle maturity increases with age. The more maturity the more defined the muscles are and it’s something only a dedicated lifter would understand. Undoubtedly it’s something that Ronald King understood. The 58 year old man looks anything but with a physique that would put some pro physique competitors to shame. King acquired his impressive form through exercise variations that most bodybuilders would frown upon and that many trainers would flat out advise against performing. Yet the results speak from themselves as King has one of the most impressive physiques out there period. With a physical form that has been sculpted through hard work, consistency and dedication, Ronald King is an inspiration to anyone looking to get into top form. Wondering exactly how shredded King is? Then take a look at the image below and behold the 58 year old’s greatness. Are you looking to stay in this kind of shape in your advanced years? Let us know in the comments and forums.